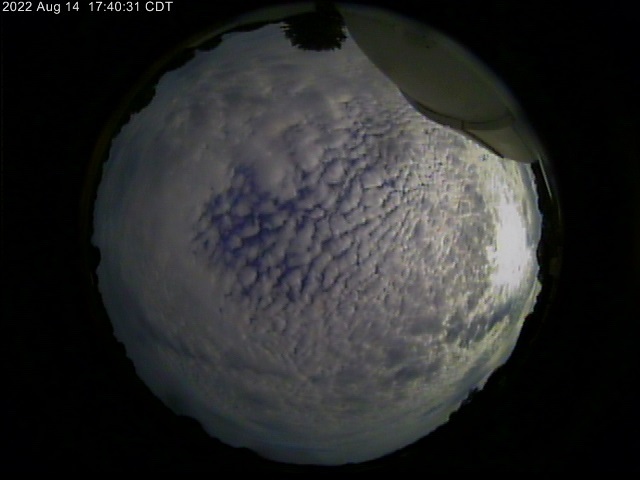 Now you can have an All Sky Cam too, thanks to Moonglow Tech's new All Sky Cam! Hit Reload or Refresh to get the latest live webcam image. Flash movie of last 24 hours (1MB). This special camera shows the entire sky, from horizon to horizon, day or night, in all weather rain or shine. North is at the top, east is at the left. The camera is currently located atop Moonglow Observatory (IAU observatory code H27). Later it will be mounted atop the Singmaster Educational Center roof, at the Charles Douglas Memorial Observatory, ICSTARS Ranch. This is a day/night color camera. On clear moonless nights the Milky Way is visible. Other astronomical objects like the Moon, planets, and zodiacal light are occasionally visible. Most streaks of light you see are airplanes, this camera catches meteors rarely. Image artifacts: During the daytime, intense sunlight will cause a bright vertical bar to appear atop the Sun. Technical details: Moonglow Technologies All Sky Cam, digitized by their ASC Uploader. © 2005-20011 Fred Bruenjes - All Rights Reserved. Image inlining (hotlinking) and/or framing are strictly prohibited. No reproduction, dissemination, repackaging, hosting, or other use of these images is allowed without written permission.